A classic thong style with wedding-day charm V-waistband Raw-cut edges Lined gusset Nylon/spandex Machine wash Made in USA of Italian fabric. Lingerie - Contemporary Collections. Commando. Color: Aqua Mist. Size: M/L. A classic thong style with wedding-day charm V-waistband Raw-cut edges Lined gusset Nylon/spandex Machine wash Made in USA of Italian fabric. Lingerie - Contemporary Collections. Commando. Color: Aqua Mist. Size: S/M. A classic thong style with wedding-day charm V-waistband Raw-cut edges Lined gusset Nylon/spandex Machine wash Made in USA of Italian fabric. Lingerie - Contemporary Collections. Commando. Color: Black. Size: M/L. A classic thong style with wedding-day charm V-waistband Raw-cut edges Lined gusset Nylon/spandex Machine wash Made in USA of Italian fabric. Lingerie - Contemporary Collections. Commando. Color: Black. Size: S/M. 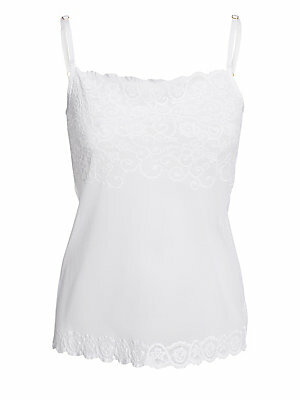 A delicate camisole rendered in sheer stretch lace for an overtly alluring, feminine touch. Scalloped straight neckline and hem Adjustable spaghetti straps Pullover style Nylon/spandex Hand wash Made in USA. Lingerie - Contemporary Collections. Commando.